Why, despite continued efforts to increase understanding and expand opportunities, do black and white Americans still lead separate lives, continually marked by tension and hostility? In his much-lauded classic, newly updated to reflect the changing realities of race in our nation, Andrew Hacker explains the origins and meaning of racism and clarifies the conflicting theories of equality and inferiority. He paints a stark picture of racial inequality in America -- focusing on family life, education, income, and employment -- and explores the current controversies over politics, crime, and the causes of the gap between the races. 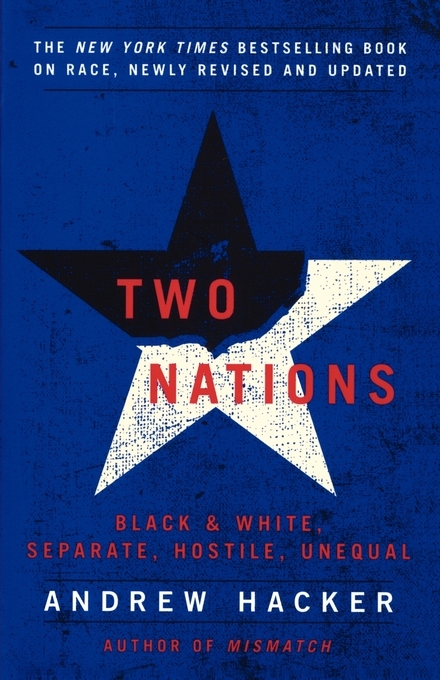 Illuminating and oftentimes startling, Two Nations demonstrates how race has defined America's history and will continue to shape its future. The Wall Street Journal A telling portrait of American life.... The numbers are stark and irrefutable. The Boston Globe Devastating....We are left with the crushing effect of what we have done to ourselves by using race as our defining tool and lying most of the time about what we are doing. The New York Times Book Review Challenging....The real value of this book is in Mr. Hacker's calm, analytical eye [and] his unblinking view of American history. Claude Brown Author of Manchild in the Promised Land Provocatively enlightening....Probably the most candid book on present-day American racism. Alex Beam The Boston Globe Provocative...eloquently written [and] in-your-face.